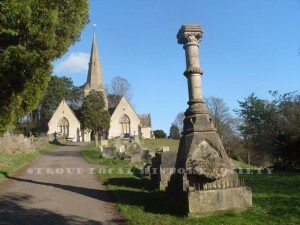 In 1992 Stroud Town Council inherited over four hectares of a largely forgotten classic mid-Victorian Cemetery which sat high on the Cotswold escarpment and commanded superb views of the Cotswold area of Outstanding Natural Beauty and on into Wales. Last year Alan Kirby, Stroud Town Clerk, commissioned the Stroud Local History Society to research the background to the cemetery and to investigate a representative group of the past citizens — recording obituaries, inscriptions and taking photographs of interesting monuments where available. At the same time, the Gloucestershire Wildlife Management Limited (the consultancy division of the County Wildlife Trust) carried out a year long full bio-diversity study into “Cemetery Conservation and Other Issues” — including balanced maintenance and educational opportunities. The report revealed a very wide range of Flora and Fauna including many rare species, which resulted in the cemetery gaining a County Key Wild Life Site status and being recognised as being of national importance. This has since been endorsed by David Manning, the Church and Conservation Project Leader, of The Arthur Rank Centre, Stoneleigh. There are many educational opportunities associated with the Living Churchyard and Cemetery Project, as illustrated in the Stroud Cemetery Education Pack, K.S.2 Science — “Life Processes and Living Things” devised by Anne Heathcote, Stroud Valley Primary, for the Stroud Town Council. Research into the history of the site by Stroud Local History Society shows that there has always been an appreciation of the unique position and design of the cemetery. 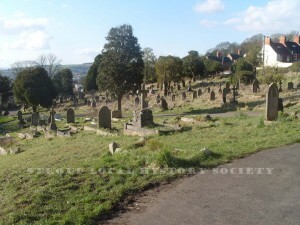 Kellys’ Directory of 1870 describes the cemetery as “large and laid out on an elevated piece of ground (near the Union House) in 1855, when the old church yard was closed; it is beautifully situated on a slope commanding an extensive view, and is a favourite Sunday resort and promenade”. 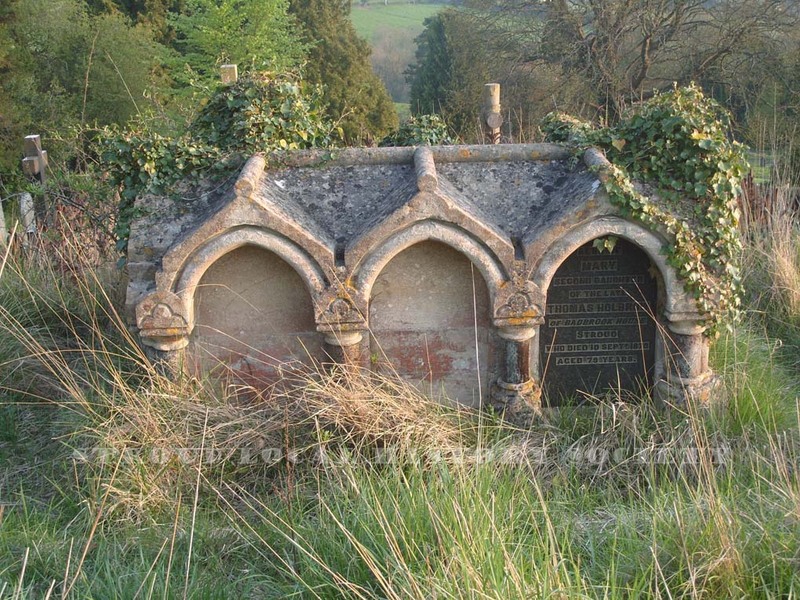 On the 6th September 1856, the Gloucester Journal describing the Consecration of Stroud Cemetery said “The Church portion of the new cemetery on Stroud Hill was consecrated by the Lord Bishop of the Diocese on Monday last. About forty of the clergy were present and there was a very large concourse of people. The morning was exceedingly fine and favourable. The new cemetery is a very pretty and advantageous site. It is a sloping piece of ground five or six acres in extent, situated about a quarter of a mile out of town, on the road to Bisley and commands an extensive and delightful view. It has been tastefully laid out with shrubs and walks by Mr. W. Foster, Nurseryman. The following day, two paupers from the workhouse were interred there. 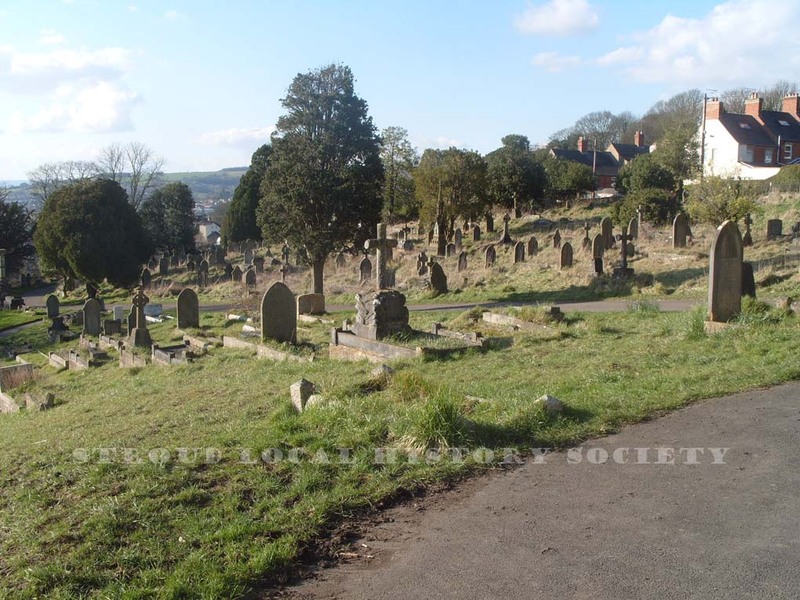 In 1854, the several burial grounds in Stroud had become insufficient in size and dangerous to health and, with the threat of closure from the Secretary of State, a new cemetery had to be created. An extensive site of approximately six acres was purchased from Mr Joseph Watts for the sum of £756.00. The site has extensive and delightful views on the southern slope of Stroud Hill, on the lower side of Bisley Road, and commands superb views of the Cotswold area of Outstanding Natural Beauty and on into Wales. The twin chapels, surmounted by a spire and the original entrance lodge were designed, in decorated Gothic, by the local architects, Messrs Baker and Son, 3 Albert Buildings, Stroud, and built to a high standard of stone masonry. The overall cost (excluding the land) was £2,800.00. The cemetery grounds were divided into three areas, Church of England (which was consecrated by Dr. Baring, The Lord Bishop of the Diocese in September 1856), Non-Conformists, and paupers. The pauper’s area was directly opposite the Union Workhouse in Bisley Road. On the 4th September 1856, William Lewis, a pauper from the workhouse, was the first person to be interred. Another resident of the workhouse was Sara Dancey Face, who died aged 100 years and 47 days and was buried in the pauper area in December 1863. She was a poor, but respected member of the Society of Wesleyans in Acre Street and one of her earliest memories was that she had once cleaned the shoes of John Wesley, when he was on one of his visits to his Society in Stroud. 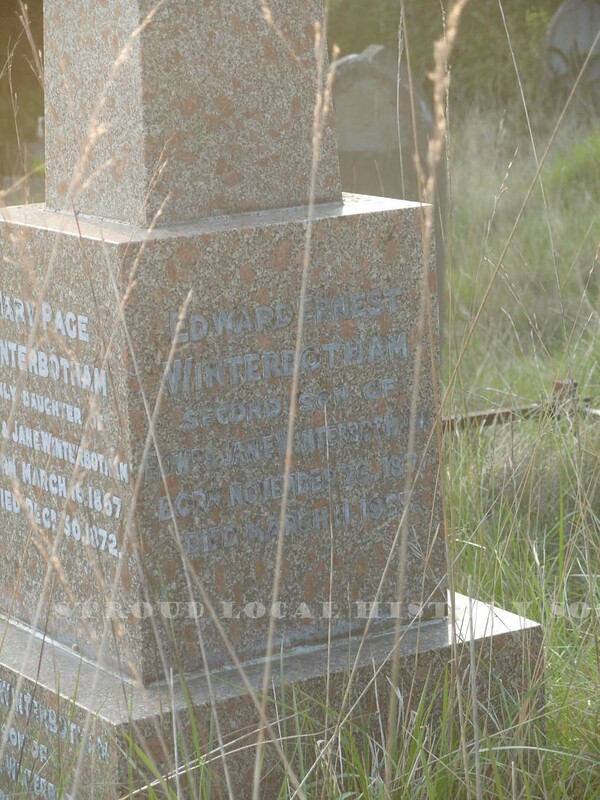 William Foster, a local nurseryman who laid out the original paths and planted many of the early shrubs and flowerbeds, was later buried in the cemetery in 1877. John Isacke was the first lodge-keeper and superintendent, who was a natural historian with a wide knowledge of the local flowers and fossils. He was the author of “Leisure Hours” a small collection of poems which was published in 1846. He would point out to visitors various landmarks — such as the Forest of Dean and the River Severn that could be seen from the wonderfully elevated position of the cemetery. George Holmes took over from John Isacke in 1873/4 as superintendent, a position he held for the next thirty-four years. A self-taught man he became an authority on natural history, receiving visits from many eminent botanists. His collection of mosses was regarded as one of the best in the district. His weekly meteorological reports were also of great value. He took pleasure in arranging the flowerbeds and shrubbery at the cemetery, which he transformed into a wonderful flower garden. The tradition of natural history is now being continued by Brian Riley — (the present Works Supervisor); who is trying to strike a balance between conservation, maintenance and accessibility by following the “Living Churchyards” guidelines. Typically, areas around the monuments and graves have been carefully cleared to avoid damage to the stone work and the many species of lichens that flourish there. Traditional meadows have been encouraged in the extensive areas where many unmarked pauper graves lie. 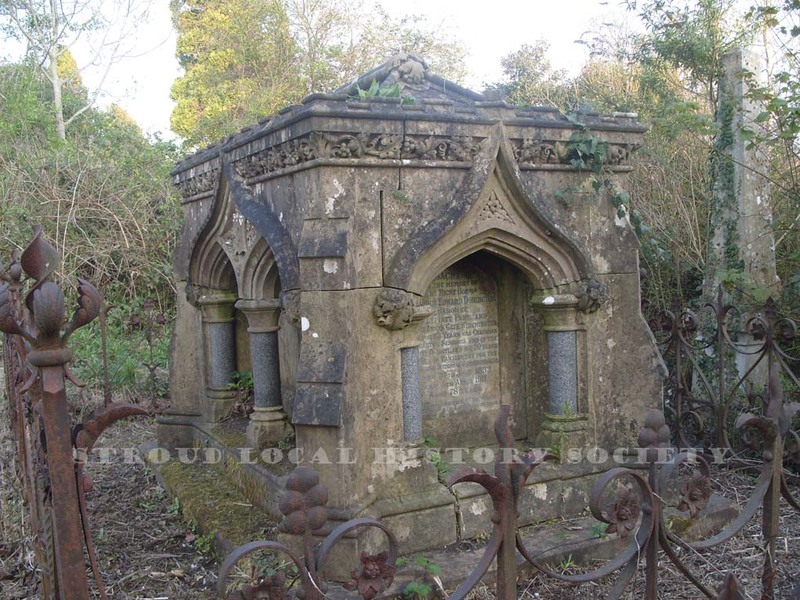 Mr Richard Wyatt, Barrister, J.P. and D.L., for the County of Gloucestershire, of Mount Serrat, London Road, Stroud, was buried in Stroud Cemetery on the 19th August 1874, aged eighty two years. He was a leading solicitor in the town and took a prominent part in procuring the enfranchisement of Stroud as a Parliamentary Borough and in obtaining the Improvement Act of 1825. He also promoted schemes for gas and water supplies, and the building of Stroud Subscription Rooms. He was a great scholar and linguist, familiar with Greek, Latin, Italian and German authors. Stephen Dudbridge, Charted Accountant of Lansdown, Stroud, was buried in the Cemetery on the 20th February 1902, aged sixty-two years. He took a prominent part in the affairs of Mid-Gloucestershire and was one of the earliest members of the Society of Chartered Accountants. When he was quite young he was elected a member of the old Stroud Local Board of Health and later to Stroud Urban District Council. He was involved with the Stroud Subscription Rooms and helped to establish the Stroud and District Trades Association. He was secretary to the Sunday School at the Baptist Chapel in John Street and was secretary to the Building Committee, which erected new school rooms in Union Street. He was an enthusiastic supporter of the local Fire Brigade and was actively involved with the Stroud Liberal Club. 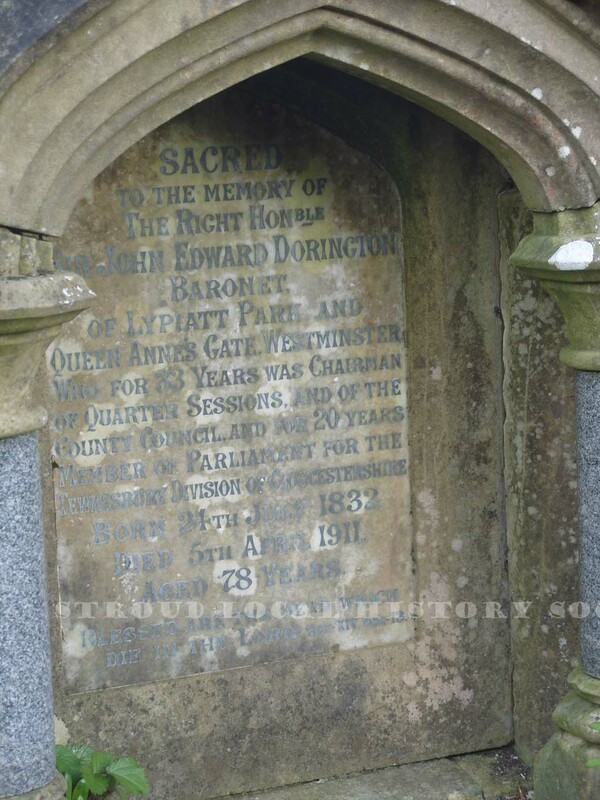 The Right Honourable Sir John Dorington MP of Lypiatt Park died on the 5th April 1911 aged seventy eight years and was buried in the family grave identified by a large handsome monument with Gothic recesses and grey granite columns. There are inscriptions paying tribute to his father John Dorington, mother Susan and his wife Georgina Hewitt, who died in 1913. A strong Conservative, Sir John represented the Tewkesbury division of Gloucester for twenty years. In 1874, which was a tumultuous year for politics in Stroud, (there were two bye-elections and a general election), Sir John represented Stroud for six weeks only – which unfortunately left no time for him to take his seat in Parliament. However, he was deeply involved in Stroud affairs, being a Governor of Stroud General Hospital and a supporter of the Nursing Association. He was a member of the Stroud Board of Guardians, served on the Rural District Council and his knowledge in regard to administrating the Poor Law was greatly respected. He was Chairman of the County Council, Chairman of the Quarter Sessions and a member of the Commission for Peace in the Country. He was made a Baronet and a Privy Councillor in 1886. George Holloway MP, Gentleman, of Farm Hill, Stroud, was buried in Stroud Cemetery 25th August 1892 aged sixty-seven years. 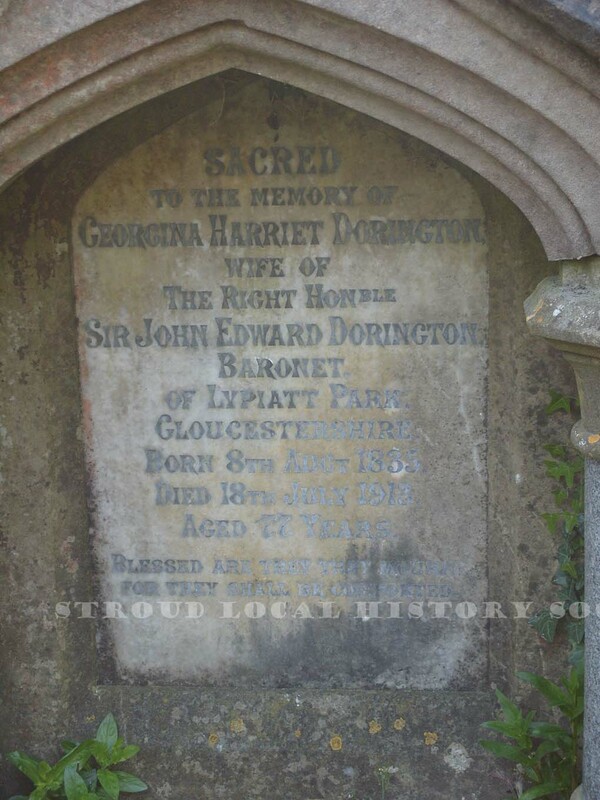 He was the Member of Parliament for Stroud from 1886 until his death in 1892. George and his brother Henry arrived in Stroud in 1849 and, in conjunction with Mathew Crowe, ran a clothing wholesale manufacturing business at 60/61 High Street, Stroud — the business later moved to Threadneedle Street where the new, revolutionary steam powered sewing machine was introduced. The business continued to prosper and, in 1920, a completely new factory was built at, Brickrow, Stroud. George Holloway was regarded as a great benefactor to the town and was the principal employer in the area. In 1875 he established the “Stroud Working Man’s Benefit Society“. 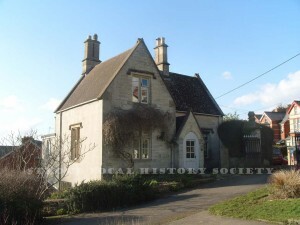 This subsequently became the “Mid Gloucestershire Conservative Association Benefit Society” whose motto was “God helps those who help themselves” This finally became the “Original Holloway Society” providing sickness and accident benefit for working men and women, along with financial needs such as a capital sum to assist retirement. His statue can be seen at Rowcroft, Stroud. Arthur Brend Winterbotham, MP, J.P., was buried in Stroud Cemetery on the 12th September 1892, aged fifty-four years. He came from a prominent Liberal family and represented Cirencester from 1885 until his death in 1892. In 1885 he joined Thomas Hunt and the established the firm of Hunt & Winterbotham, woollen cloth manufacturers of Cam. His grandfather, the Reverend William Winterbotham (1763-1829) a Baptist Minister at Plymouth, was fined £200.00 and imprisoned at Newgate Gaol for four years following a trial at Exeter Assizes in 1793 charged for preaching a sermon “advocating an extension of civil and religious liberty”. He later became the Baptist minister at Shortwood Tabernacle near Nailsworth from 1804-1829. His father, Lindsey Winterbotham, (1799-1870) resided at Bank House, High Street, Stroud. He was the General Manager and Inspector of Branches for the Gloucestershire Banking Company — previously he had been a Solicitor at Tewkesbury and mayor of that town. He married a Sarah Anne Selfe Page and carried on the family religious beliefs as a Deacon of the Bedford Street Congregational Chapel. Arthur Brend’s older brother, Henry Selfe Page Winterbotham, M.P & Barrister, (1837-1873) was a Liberal MP representing Stroud from 1867-1873. In 1870 he had been appointed Under-Secretary in the Home Office. He died in Rome and it was claimed that “the work of the office had killed him”. 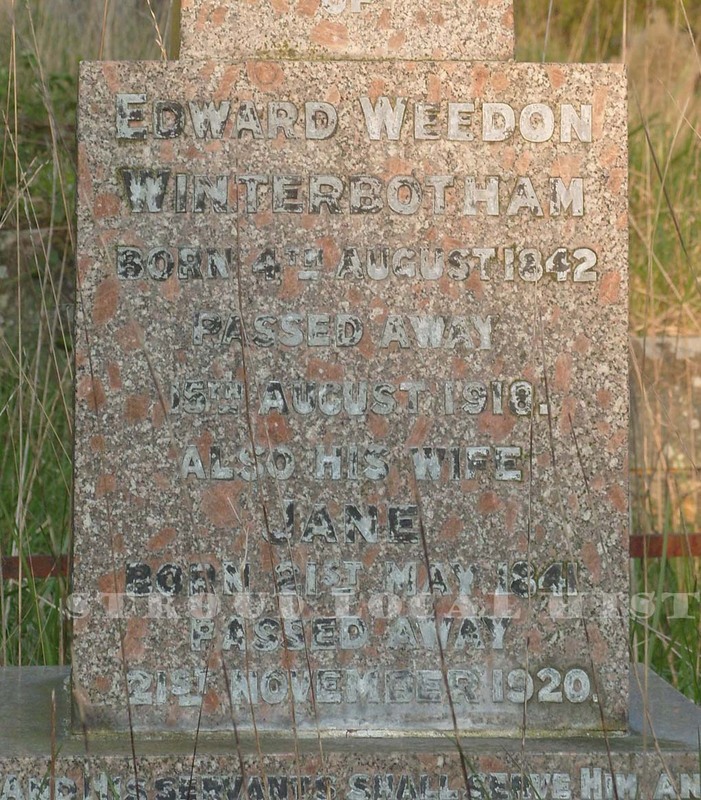 Edward Weedon Winterbotham, of Bank House, High Street, Stroud, was buried in Stroud Cemetery on the 15th December 1918, aged seventy-six years. 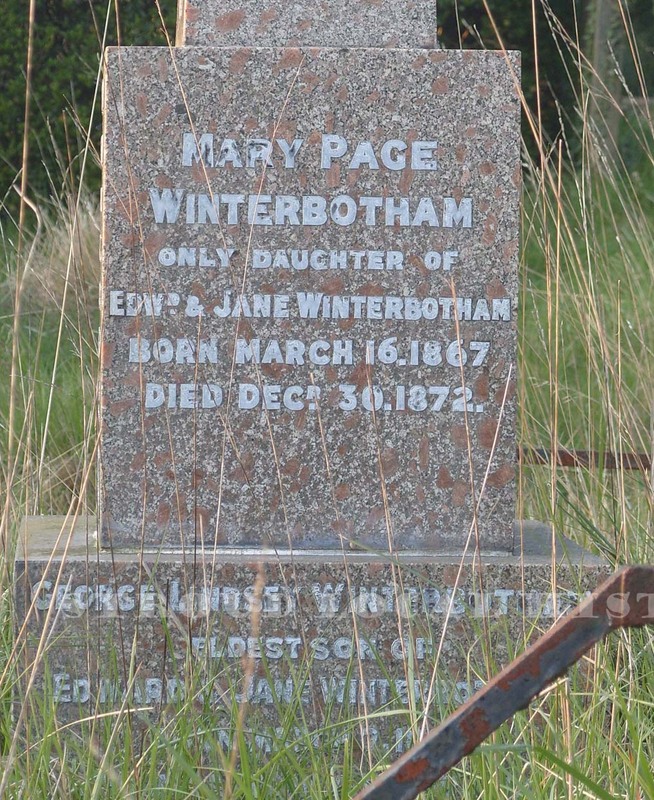 He was the fourth son of Lindsey Winterbotham and succeeded his father as manager of the Gloucestershire Banking Company — this eventually became the Capital & Counties Banking Company. He was the Treasurer of Stroud & Wheatenhurst Boards of Guardians & Rural District Councils. He was also an active member of the Bedford Street Congregational Chapel and their Treasurer from 1884-1917. Lindsey William Winterbotham, (1826-1884), of The Birches, Stroud, was the eldest brother of Arthur Brend Winterbotham. He was a Solicitor at Rowcroft, Stroud — the practice still exists today, working from the same address, known as Winterbotham’s Solicitors. He was also Clerk to the Burial Board, Hon. Clerk to the Painswick School Board and an active member of the Bedford Street Congregational Chapel. In 1930 Mr Ernest Winterbotham and his two brothers presented the garden behind the 18th Century Bank House, in the High Street, to the town as a memorial to their parents Mr and Mrs Edward Winterbotham. 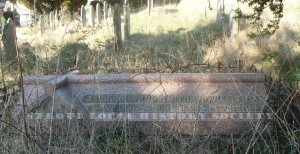 John Selby Howell died in June 1867 and was buried in Stroud Cemetery. 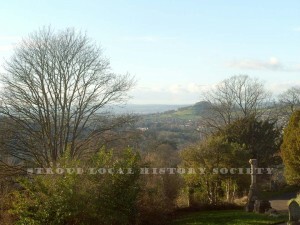 The people of Stroud erected an ornamental truncated Obelisk on his grave in recognition of his fifty years service as Parish Clerk of Stroud. His many duties also included being the Registrar of Births and Deaths 1858/59, and he was also the last schoolmaster of the “Red Boys” Charity School — a position he held for forty-eight years. The “Red Boys” were originally educated on the first floor of the Market House (now the Old Town Hall). They moved to the floor above in 1816/17 and the old school room was renovated for the use of Magistrates and local people at a cost of £500.00, which was raised by subscription. Percy Witchell, who was buried in the cemetery on the 4th June 1902 aged forty-seven, was not only Clerk to Stroud Urban District Council but was also Clerk to the Old Board of Health and the Society for the Prosecution of Felons. With his brother Edward he carried on the practice of Messrs E Witchall and Sons, Solicitors, Lansdown, Stroud — which his father had founded. 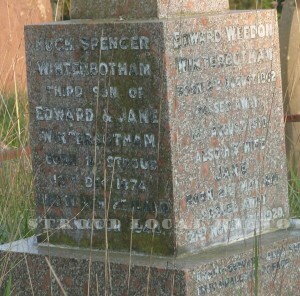 His father Edwin Witchell, who was also buried in the cemetery, on the 25th August 1887, aged sixty-four years, had been Clerk to the Local Board of Bisley, Clerk to the Board of Health, Clerk to the Stroud & Gloucester (through Pitchcombe) Turnpike Trust and was a well known Gloucestershire Geologist. Geoffrey Randall, who was buried in the cemetery on the 21st March 1872, aged sixty-six years, had first served as a clerk and accountant after the establishment of the County Court. Judge Francillon later appointed him as High Bailiff of Stroud County Court. He was also Secretary of the Stroud Building Society and the Stroud Provident Building Society. John Biddell, a wealthy businessman and mill owner, died on the 25th April 1863, aged seventy-four years. He was the owner of Stratford Mill (which was a flour-mill) and the adjacent Stratford Abbey and later expanded by acquiring Cuttle’s Mill at Wallbridge. Although very prosperous himself, he took great interest in the problems being experienced by local farmers and worked ceaselessly to protect British agriculture. On the 25th February 1845 a testimonial was presented to John Biddell, Esq by the farmers of Gloucestershire recognising the work he had done on their behalf. A silver kettle with stand inscribed “Presented to John Biddle, Esq; of Stratford Abbey near Stroud, by the farmers of Gloucestershire for his zealous exertions in the cause of Protection to British Agriculture Tues, Feb 25th 1845”. It was noted that there were three hundred subscriptions of five shillings each. He was involved with local charities, helping to raise money for schools and Stroud Hospital. A commemorative window, depicting the Acts of Mercy, was installed in the gable window of the north transept of the Parish Church to the memory of John Biddell and his wife Hannah. Richard Townsend, of Thanet House (now occupied by the Stroud Town Council), died on 22nd April 1896, aged fifty-seven years. 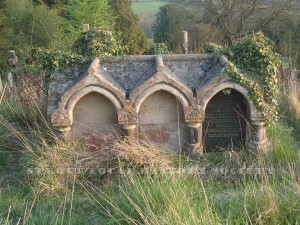 He was buried on the 25th April 1896 — Mr Philip Ford, of Stroud, was the undertaker and coffin maker. Richard Townsend was a well-known member of the firm Messrs R Townsend & Stacey of Stroud and Gloucester. It is interesting to note that staff from the Gloucester area were unable to attend the funeral because of a small-pox outbreak in that area. The business continued to flourish under the control of his son, Richard Townsend (corn merchant and dealer), who in 1901 purchased Stratford Mills for the manufacture of cattle cake, fertilisers and their corn business. David Williamson, a Wholesale Clothes Manufacturer, died at the Royal Free Hospital, Grays Inn Road, London, aged sixty-six years. 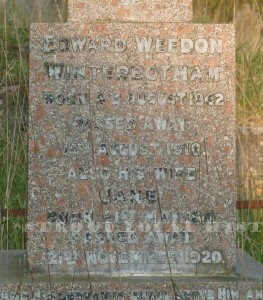 He was buried in Stroud Cemetery on the 4th April 1896. In Kelly’s Directory 1870, David Williamson of 4 Albert Buildings is described as a travelling draper. A reference in A History and Guide to Gloucestershire 1909 refers to the growth of the ready-made clothing trade during the second half of the nineteenth century – originated by the Holloway Brothers. However they had competition from a factory carried on for some years, off George Street, by Messrs Williamson, Tratt and Co. In 1900 they erected a large factory in Cheapside., to the south of the G.W.R. Station. This building was later occupied by Messrs Hill Paul Co., Wholesale Clothiers — the name by which it is still known today. David Williamson was a strong Nonconformist, a Deacon at the Old Chapel, and was also a superintendent of the Sunday School which was run there. At one time he was a member of the Stroud School Board. “Mathew Grist, Woodchester, Stroud, Flock Manufacturer established 100 years ago. Four generations in the business with a son qualifying to be the fifth generation. William Henry Withey, Gentleman, of Upper Gannicox Stroud, was buried in the cemetery on the 29th September 1899, aged eighty-eight years. He was the son of James Withey, the well-known grocer at 55 High Street. William Withey, for over half a century, was prominently involved with commercial, social, and public life in Stroud. He was very much a self-educated man who left school at the age of eleven to help run the family business. At the age of thirteen/fourteen years, he acted as traveller, visiting the numerous small mills of the district for many different goods. Upon the death of his father, William showed his business expertise and prospered greatly. For a long time he was the Stamp Distributor of the district — he held a licence from the government to sell Bill Stamps and others affecting deeds. He also became a property developer — building houses between the railway and Bath Place. He also sold land for building alongside the new turnpike to Chalford. Like his father he involved himself in local affairs and became a Feoffe in 1844, a Commissioner of the Turnpikes, and was one of the new commissioners appointed by the Charity Commission in 20th June 1862. He was one of the seventeen governors appointed by the Charity commission, following Royal Approval given on the 28th November 1887, to set up Marling School. It is well worth while visiting Withey’s Yard, just off the High Street in Stroud – which is a permanent reminder of this interesting family. William Cowle, died at the age of eighty and was buried in Stroud Cemetery on the 4th January 1890. He began his working life as an apprentice to Mr Mills, a grocer in the High Street — followed by a period of time working in Bristol. Upon his return to Stroud he opened, in George Street, his own business, which he eventually sold to Mr T Smith. He then turned his talents to land speculation in the neighbourhood. He was one of the joint purchasers of Rodborough Manor, then the Field Estate – where he personally superintended the work of dividing and laying out of the land. He was a member of the Conservative Party and, together with Mr G Holloway and Sir John Dorrington, purchased Badbrook Hall, which later opened as the headquarters of the Constitutional Party, as it was then called. At the time of his death this public-spirited businessman was a childless widower and, not having any close family members, donated in his Will £4000.00 for the establishment of a Museum. This was built in Lansdown (on the corner of Locking Hill) in conjunction with the Stroud School of Science and Art. This impressive building is still a landmark in Stroud and is worth a visit to view the Victorian architecture. 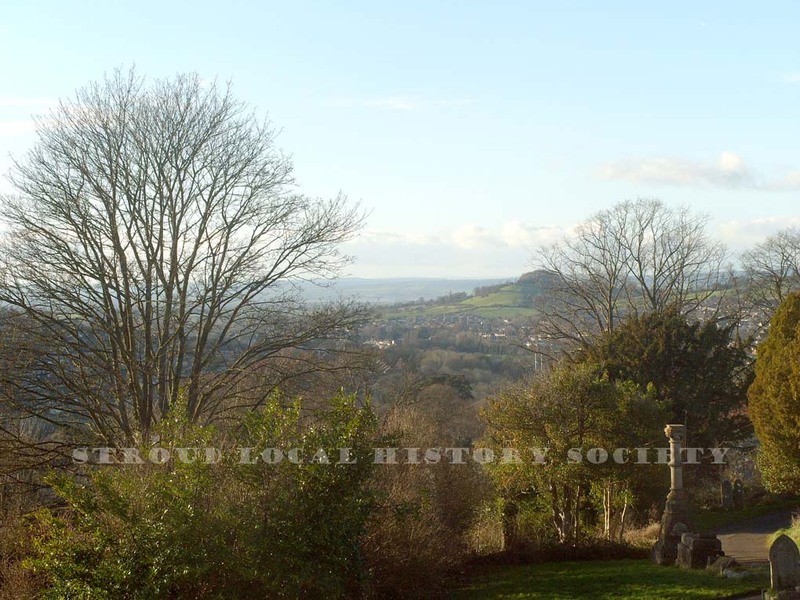 William Cowle was also very interested in astronomy and had built his own observatory on land situated near Stroud Hospital — which under the terms of his Will was made available to the people of Stroud. Although a new Museum has been recently opened in Stratford Park, the original museum building stands as a constant memorial to William Cowle. When he first came to Stroud in 1886 he was a member of Congregational Old Chapel and was for a number of years a Deacon and Church Secretary. Later he joined the Congregational Church at Bedford Street where he became a member of the diaconate, and a very active worker at the church and preached in most of the pulpits of Nonconformist churches and chapels in the area. His name will always be remembered in Stroud for the gift of Park Gardens, in Slad Road, which was given as a memorial to his only son who was killed in the First World War. Not only did Mr Park donate the land but also gave the handsome gates, the fencing and a memorial tablet, all dedicated to the memory of his son — he also gave the sum of £200.00 towards the laying out of the gardens. Shortly after his gift, the Urban Council announced that Mr J Mills had donated an adjoining strip of land to enable the gardens to extend to the top of Uplands Pitch. These gardens are an enduring memorial to both Sidney Park and his son. Mr James Okey was buried in the Cemetery on the 13th February 1897. James Okey, of George Street, was 75 years old when he died. It was from 20 George Street that he carried out his business as a Boot Maker and Toy Dealer. He was an extremely respected businessman and represented the rate-payers of Stroud for nearly twenty years on the Stroud Local Board of Health. He was an active member of the Old Chapel for fifty six years — he was a Deacon for thirty years, and Treasurer for fourteen years. He also acted as superintendent at the Sunday School for many years. When failing health forced him to resign from public life (when the Board of Health became the Urban District Council) it was recorded that every single member present regretted the decision. William Henry Paine, M.D., Member of the Royal College of Physicians, was buried in Stroud Cemetery on the 19th June 1890, aged sixty six years. Dr Paine joined the United Hospital in 1851 as Assistant Physician and, shortly afterwards, was appointed sole physician at the old hospital in George Street. He eventually became an active promoter for building the new hospital in 1874, at Trinity Road. Dr Paine held numerous public appointments including J.P, Guardian of the Poor, and a Member of Stroud School Board and supporter of the Scientific and Educational Institutions. It was his Public Health Campaigns that lead to sanitary reforms, including the closing of the Parish Churchyard and the purchase of the new cemetery at Bisley Road. His place of death was Corbett House, Stroud. 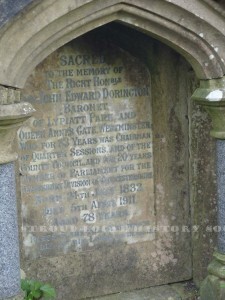 Edolph Andrew Uthwatt Esq was buried in Stroud Cemetery on the 25th January 1882, aged seventy seven years. In 1870 he was Consulting Surgeon at the General Hospital in George Street. His residence was given as Gannicox, Stroud — his place of death was Far Hill, Stroud. Dr Thomas Partridge, M.R.C.S., M.R.C.P.I; was buried in Stroud Cemetery on 21st November 1906. He was appointed Medical Officer for the Urban District of Stroud and Nailsworth and the Rural District Council in 1870. Interestingly he was one of the first Medical Officers of Health to be appointed in the country. John Carless, M.D., C.M. Physician, was buried in Stroud Cemetery on the 23rd December 1874, aged fifty four years. In 1870 he had established a Homeopathic Dispensary, initially in rooms above Elliott’s the Printer in the High Street and later in George Street. Amongst his patrons were Lady Shakespeare and Sir Hungerford Pollen, Bart. His place of death was The Grange, near Stroud. Thomas Liddiate Chew was buried in the cemetery on the 26th September 1870 aged fifty four years, and his obituary observed that he was a true artist with a very well known reputation. Thomas Chew originally carried on business as an iron and metal worker and founded a business known as Messrs T L Chew and Sons, Medieval Iron Works, Stroud. He was very sought after for designing of ornamental ironwork throughout the county – particularly by the gentry for their mansions. A remarkably splendid design of his supports the large Chinese bell at Berkeley Castle and other examples of his skill can be seen at Stroud Cemetery, St Lawrence Church, Stroud, and Selsley Church. James Chew, Professor of Music and Organist, was buried in the cemetery on 11th March 1899. He was born with an outstanding musical talent, which developed despite his humble background. At the young age of fourteen he was the organist at Chalford Church. After a brief spell running an inherited business, he devoted himself entirely to music. He became a Professor and was appointed organist at Stroud Church — where he served under five vicars and helped to purchase the new organ in 1871. He was music instructor at nearly all the schools in the neighbourhood. However, probably he will be remembered mainly for the concerts he organised over a period of thirty years raising funds for Stroud Hospital. His good work did not finish there, he provided annual entertainment for the Bisley Road Workhouse and promoted concerts at the Subscription Rooms for the aged and poor. His philanthropy and public spirit were greatly missed. James Dickinson Humpidge, Engineer, was buried on the 10th June 1903 aged forty-two years. One hundred and forty workmen from his business, at Central Iron Works, attended the funeral to pay their respects to a highly regarded master. He had been a very active member of the Gloucestershire Engineering Society and representatives from many engineering companies attended the funeral. He had also taken part in the activities of the Lansdown Baptist Church and had been a Deacon, Church Secretary and Superintendent of the Sunday school. 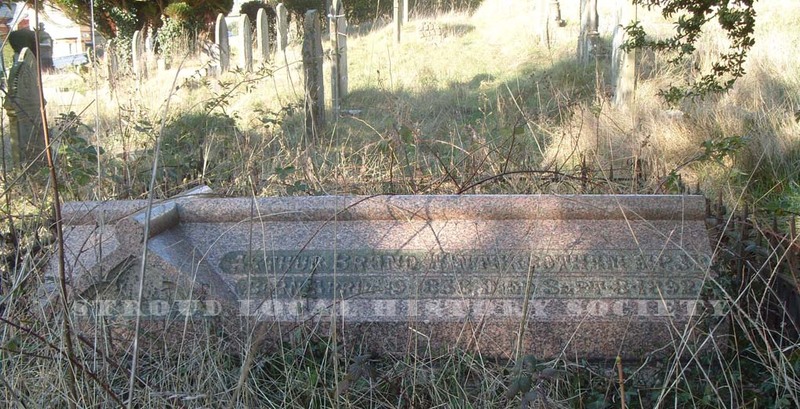 Thomas Henry Daniels, the senior partner of the firm of T H & J Daniels, engineers, of the Lightpill Iron Works, Stroud, was buried in Stroud Cemetery on the 9th June 1897, aged fifty eight years. He had been an ardent member of the Masonic Fraternity and, on the very day of his funeral, he was to be invested as Provincial Grand Sword Bearer of the Province to honour twenty years dedicated work as a Freemason. In conjunction with his brother, Mr Joseph Daniels, he had established a successful local industry which filled a void in manufacturing. He had been a member of Stroud District Council, a staunch Conservative and had for many years been a trustee of the Rodborough Endowed School, and a Church Warden for the parish. John Ferrabee, Ironfounder and Machine Maker established the original business at Thrupp in 1818. He modified the mill and established an iron foundry known as the Phoenix Iron Works. From 1851 to 1855, the firm was ran by John’s sons James and Henry, then solely by James. He carried on with the production of cloth making machines, water wheels, agricultural machinery and steam engines. It was at these works that, in 1830, the first lawnmower was produced —the invention of a local mechanic, Edwin Budding. John Ferrabee financed the development and the patenting. An adjustable spanner invented by Budding was also produced. James Ferrabee moved to Port Mill in 1863 – George Waites & Co carried on the foundry business, at Phoenix Iron Works. Later in 1872 another change of ownership to Barton, Sons & Waller and, finally, with George Waller taking control. However James Ferrabee was still involved with machine and cloth manufacture and in 1867 had a fine display of both at the Paris Exhibition, for which he was admitted as a member of the Academic Nationale Agricole, Manufactuiere et Commerciale. In 1871 he exhibited at the Woollen Cloth Manufacturers at the International Exhibition a “fulling and dressing machine” equipped with teazles. In a letter to the Stroud Journal he gives the credit to Lewis’s of Brimscombe for inventing the cloth shearing machine. 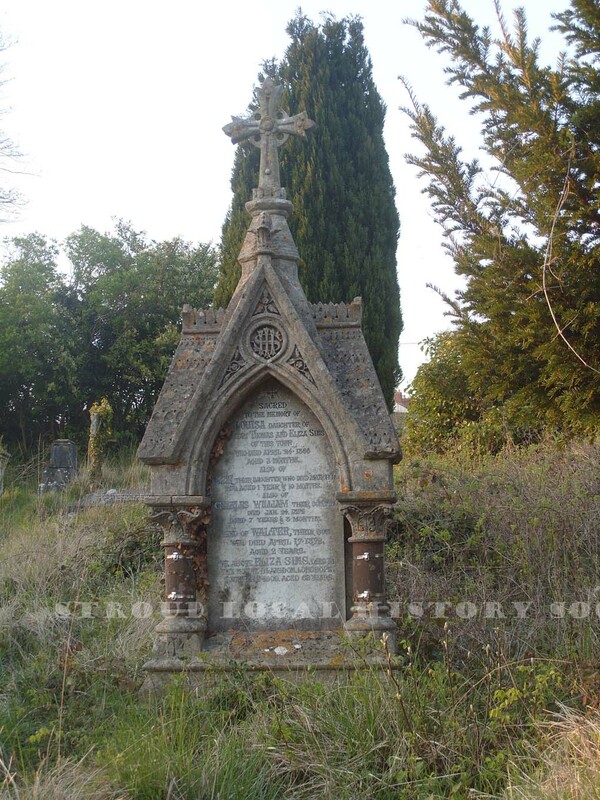 James Ferrabee was buried in Stroud Cemetery on the 14th January 1875, aged 54 years. His father’s memorial stone with the inscription “John Ferrabee of the Phoenix Iron Works, died 24th February 1850 aged sixty-four” (following a road widening scheme) was relocated from the Old Chapel, Stroud to Stroud Cemetery. Thomas Hackwood was buried on the 15th March 1902 aged thirty-nine years. He was a Fellow of the Royal College of Organists and was the organist at Stroud Parish Church and conductor of the Stroud Choral Society. He was a musical prodigy, studying music from a very early age and he was only eleven years old when he was appointed organist of the Church of St Paul, Jarrow-on-Tyne (this was prior to his move to Gloucestershire), a position he held for six or seven years. At the age of eighteen he came to Gloucester as the pupil of Dr Lloyd, who was the organist at Gloucester Cathedral. In addition to his professional duties, Thomas Hackwood collaborated with Sidney Cubitt in writing comic operas, which were performed at the Subscription Rooms. He also had a great interest in Freemasonry and was a member of Hicks Beach Lodge — where his musical services as organist were greatly appreciated. Rev. William Wheeler, a Dissenting Minister, was buried on the 27th September 1873 aged seventy one years. He came to Stroud in 1843 as minister of the Independent Church in Bedford Street — a position he held for thirty years. During this period he devoted much time to educating and training young men and generously gave the stipend he received from the church and congregation in supporting them through college. He was also involved in civic duties and in 1869 became a committee member of Stroud General Hospital. 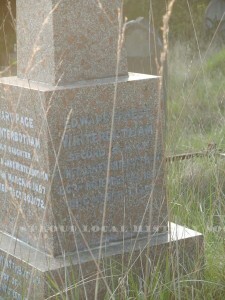 Ingram Plested, a retired schoolmaster, was buried on the 18th February aged seventy eight. He was for forty years a master at the British School at Badbrook, Stroud. The British School was built by subscription in 1840 and in 1854 obtained a government grant towards its upkeep — the remaining half coming from voluntary contributions and pence. Rosa Stella Isacke was buried in Stroud Cemetery on the 14th April 1919, aged eighty-two years. For many years she had been the Principal of Stratford Abbey College, a very highly regarded establishment for young ladies, founded in 1820. In 1870 the Misses Isacke were assisted by six masters and five resident governesses. She and her younger sister, Clara Ada, were for nearly fifty years associated with scholastic work at Stratford Abbey. The sisters were the daughters of James Isacke a “Brush and Mop maker” of 25 Church Street, Stroud, who was also buried in Stroud Cemetery, on the 29th December 1884, aged eighty-five years. In 1907 the nieces, Stella, Kitty and Muriel, took over the running of the school and continued for a further twenty years. Stella died on the 26th June 1977 aged one hundred years. Hannah D, daughter, aged 18, unmarried..
Hannah was a poet with several of her poems appearing (along with John Isaske) in P H Fisher’s original Log Book at the Gloucester Records Office. After Clara Ada’s marriage to Mr Joseph Daniels, Rosa continued running the College until about 1905, when following a seizure, she delegated the position of principal to her niece, also called Rosa Stella. John Isacke was recognized both as a poet and natural historian and was highly praised by the Local Historian, P H Fisher. Several of his poems, along with some by Hannah D daughter, of James Isacke, appear in Fishers original Log Book (Gloucester Records Office). P H Fisher in his published work “Notes and Recollections”, records that in June 1841 the Stroud Mechanics Institute organized a ten day exhibition in the Subscription Rooms which closed with a Horticultural Show. Messrs William Ferrabee, Edwin Gyde and John Isacke were thanked for their valuable services. In 1856 John Isacke went on to become the first lodge keeper (superintendent) at the Bisley Road Cemetery.